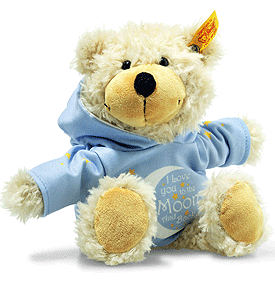 Steiff Charly Love You Dangling Teddy with Hoody is made by hand, in the finest beige cuddly soft plush. All textiles in the Steiff Best for Kids range are tested for no harmful substances and certified by the standard Oko-Tex Standard 100 for child safety. Charly is 23 cm tall and made from incredibly soft plush fabric. His beige coat is curly and his black nose accentuates his jolly look. The soles of his feet are caramel-coloured. Sitting is no problem for this cute little guy thanks to the bean bags sewn into his bottom. The pullover can be removed. The front of the pullover says "I love you to the moon and back." The text is surrounded by a white half-moon. Gold stars of various sizes complete the decorative design. The sleeves also have yellow stars printed on them. The hood has openings so that the Teddy bear's ears can poke through.